Baby Thomas - Falklands Adventurer.Off on his travels before he was born! Baby Thomas is a Falkland Islander who has never set foot in the Falkland Islands. He is the son of Stanley resident, Andrez Short, and school teacher Alison Davies, who taught for several years in Stanley Junior School, and was briefly a fisheries inspectorate observer, flying with FIGAS ( Falklands Government Air Service). The Commander British Forces Falkland Islands, Air Commodore John Cliffe, has told a concerned Islands population that despite the recent withdrawal of British troops from the Island of South Georgia, ?we will go back and land troops from time to time on exercise, to show that we can reinforce rapidly if the need arises'. 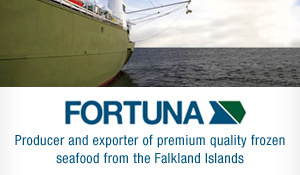 Thumbs Up for Falklands Food. Falklands food, the Islands' healthy agriculture and the Shackleton Scholarship Fund have enjoyed positive publicity in Britain from a visit by the journalist and culinary expert, Frances Bissell. The European Parliament is calling for a gradual phasing out of fishing vessels over 20 years old from the EU fleet. The recommendation is one of 37 separate measures adopted by the Parliament at a meeting in Strasbourg last week which also considered shocking evidence of the danger of EU fisheries. With 1347 vessel causalities, including 160 deaths, in 1998, fishing is a highly dangerous profession and a high risk sector. The Commander of the frigate which saved the crew of the doomed destroyer HMS Sheffield in the 1982 Falklands conflict, Captain Paul Bootherstone, has died of a heart attack, aged 62, only nine years after leaving the Royal Navy.